The Ashland Forest Resiliency Stewardship Project selectively thins trees in the Ashland Watershed to reduce fire danger and promote forest health. Once thinning operations are complete, professional teams introduce controlled burns. These crucial tools for forest restoration build healthier communities by reducing the risk of uncharacteristically large wildfires and provide sustainable economies. The pictures below give a snap shot of some units before and after ground based commercial thinning was completed. Small trees were selectively thinned from around large old trees, shown in the pictures below with white arrows. 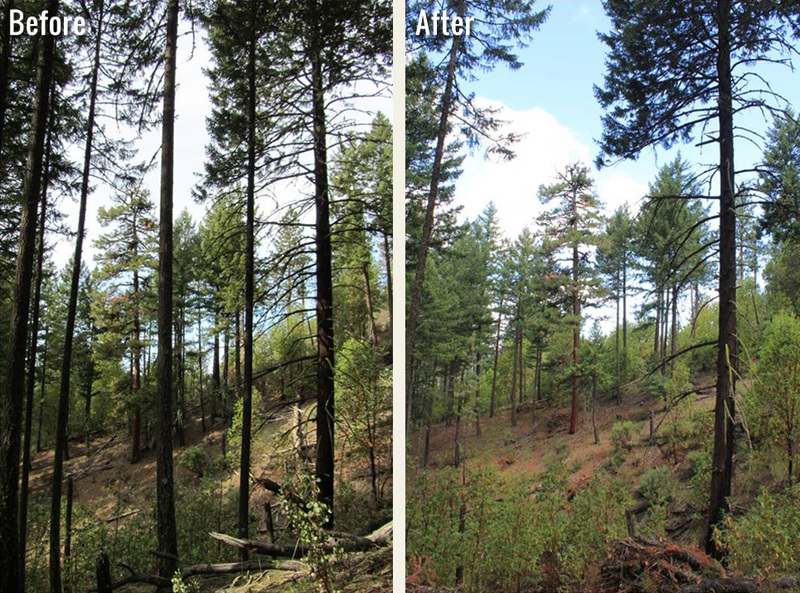 Reducing fuels and increasing resources available for these large old trees improves forest health and makes these "legacy trees" more likely to survive a future wildfire. The photos below provide a more complete picture of how smaller trees, brush, and debris were ecologically thinned around large, old trees. This "legacy tree release" reduces competition for light and reduces, creating more space in the canopy, and making more light available to the understory.